I had a fun request come in from a colleague the other day. They had a simple list of fully qualified file names and they needed to present that data in the familiar hierarchical tree layout. To demonstrate, I took a little trip down memory lane and grabbed a subset of presentations I’ve done over the years. There was a time, many moons ago when CLOB, BLOB and BFILE did not exist as data types. So if you had anything longer than a few kilobytes of data to store, you had to use a LONG or a LONG RAW. But those data types came with all sorts of restrictions and frustrations, and we all embraced the improvements that the LOB data types brought in Oracle 8. But of course, we carry a lot of that historical “baggage” in the data dictionary. 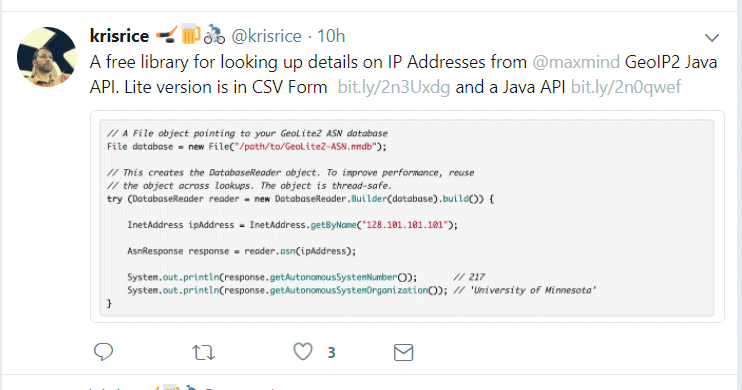 Kris Rice made mention on Twitter about the free (but limited lifetime) IP address to Country mappings that you can get from Maxmind. Lets say I’ve been reading about schema separation, and thus I am going to have a schema which owns all of my objects, which I’ll call APP_OWNER, which will have no connection privilege and a separate schema called APP_ADMIN which will take care of all of the DDL tasks. I had an interesting AskTom question recently where the poster was using SQL Loader to load in tables, but wanted to be able to analyze the resultant log file after execution. And of course, what better way to analyze..well…anything…than with a database and some SQL. So we need to be able to access the log file as a table, and an external table is perfect for that, so let’s start there. Here’s a sample SQL Loader log file (with a little perturbation to preserve anonymity). It’s quite complex because multiple tables were loaded as part of a single SQL Loader run. Yeah, sure it would be cool to crank up some big time powered VM’s in the cloud and let rip, but the reality is – if you’re starting out on a cloud exploration, you probably want to (initially at least) just dip your toes in the water and start with something small. For example, if I wanted to play with 12c Release 2, I can just sign up for an Exadata Express service so I can explore the new features without breaking the bank. I didn’t see a PL/SQL version on https://rosettacode.org for the Haversine formula so here’s a version for anyone that needs it.